"The Russian philologist and literary philosopher M.M. Bakhtin used the term chronotope to designate the spatio-temporal matrix which governs the base condition of all narratives and other linguistic acts. The term itself can be literally translated as "time-space" (...) the chronotope is 'a unit of analysis for studying language according to the ratio and characteristics of the temporal and spatial categories represented in that language'. Specific chronotopes are said to correspond to particular genres, or relatively stable ways of speaking, which themselves represent particular worldviews or ideologies. To this extent, a chronotope is both a cognitive concept and a narrative feature of language." It seems that this concept if more about narrative and literature analysis but I found it quite relevant when thinking about the evolution of location-based services. Five years ago, location-based services was all about "annotating places" or having "location-based buddy-finder", a more distinctive line of research is now gaining more and more weight: the collection and representation of traces left by people in space through technologies. Will be word "chronotope" be pertinent to refer to these visualizations? "Sashay is a mobile phone application that leverages the fact that every fixed mobile phone cell tower transmits a unique ID that can be read within the phone’s software. As a user moves throughout an urban landscape this “cell ID” changes. Sashay keeps track of the temporal patterns, history, and adjacencies of these cell encounters to help it build a visualization of connected “places”. (...) The value of Sashay is not in helping you navigate or realize that you are in downtown Austin or at a park in Boston. It is meant to explicitly remove such labeling and leave only an intentionally skeletal sketch of a person’s personal patterns across a city, leaving the individual to wonder and construct their own narrative and meaning. The temptation to build a labeled map is so compelling to many researchers that we are reiterating and advocating the extraordinary value of keeping such visualizations free from literal place labelings." 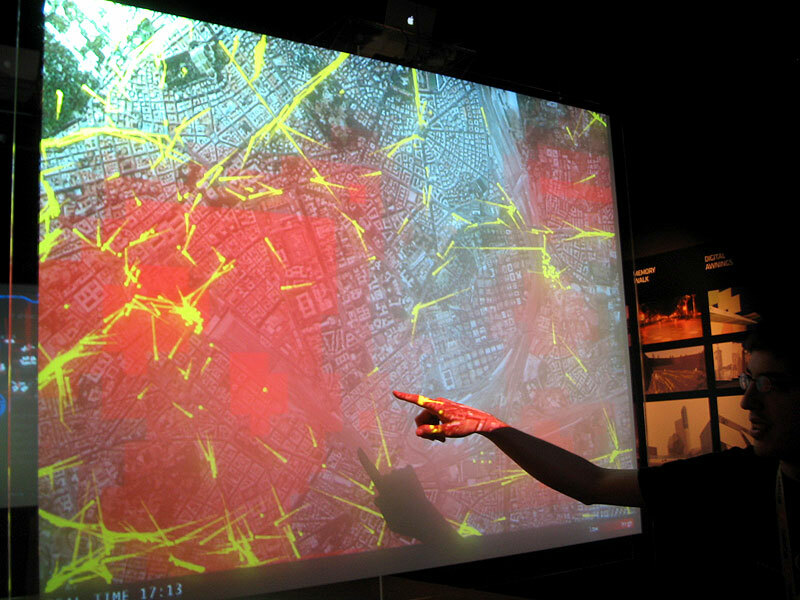 "Real Time Rome is the MIT SENSEable City Lab’s contribution to the 2006 Venice Biennale, directed by professor Richard Burdett. The project aggregated data from cell phones (obtained using Telecom Italia's innovative Lochness platform), buses and taxis in Rome to better understand urban dynamics in real time. By revealing the pulse of the city, the project aims to show how technology can help individuals make more informed decisions about their environment. In the long run, will it be possible to reduce the inefficiencies of present day urban systems and open the way to a more sustainable urban future?"